I’ve used organic gluten-free oats to produce a firm and crisp texture that doesn’t crumble or snap off easily like other gluten-free flour options. 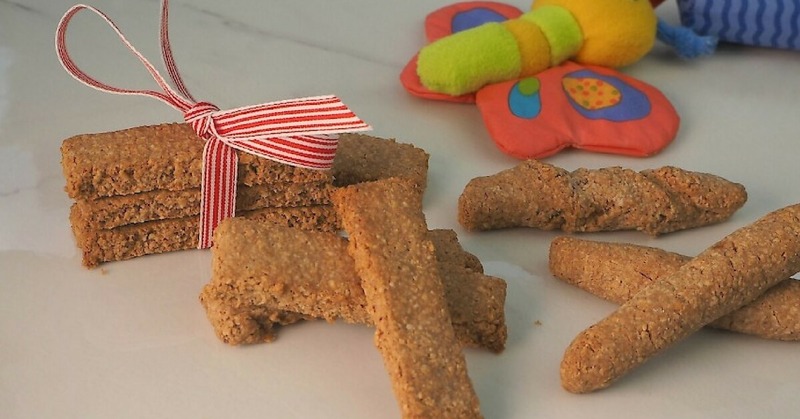 You can also use the rusks straight from the freezer to help soothe your teething baby. The rusks can also be shaped to make it easy for babies to grip and hold. (Note: While creating rusks for my young grandson, I found rusks made from coconut flour snapped off too easily, grounding down oats produced the best texture). Preheat oven to 150c (fan-forced) and line a large baking tray with baking paper. Add the oats, coconut, arrowroot and cinnamon to a food processor. Process for approximately 25 seconds to produce a fine texture. Add the mashed banana, coconut oil and vanilla. Process for 10 seconds, scrape down the side of the bowl and process for a further 10 seconds (the mixture will come together into a ball). Remove the blade and allow the mixture to sit for 4 – 5 minutes. Place the soft dough between 2 sheets of baking paper and roll out to a 0.5cm thick rectangle. Cut dough into 2cm x 8cm strips. Use a metal spatula dusted in arrowroot to slide under the strips and place on the lined tray. Depending on the age of your baby you can shape the strips to make it easier for them to grip and hold. For very young ones you can gently squeeze the strips and twist 3 – 4 times to give a textured surface to help the rusk not slip out of their hand or make smooth log shapes. Leave the strips as is for older babies. Bake for 40 – 45 minutes or until dried out and crisp, the rusks should be hard and unable to break off when chewed or sucked. (The rusks can be put back into a heated oven after baby has sucked one end to crispen up again to be reused). Store a few rusks in a glass airtight container for up to 5 – 7 days and the remaining in the freezer for up to 3 months. Previous PostPrevious Political Discourse or Sexist Abuse? Did Leyonhjelm Cross A Line?